Legacy of the First Blade is the title of the first major extension to >Assassin's Creed Odyssey. The DLC was divided into three episodes, developed and released by Ubisoft, the owner of the franchise. In Assassin's Creed Odyssey: Legacy of the First Bladewe fight shoulder to shoulder with the first hero who used the iconic hidden blade. We are talking about Darius, responsible for the murder of King Xerxes, which he did in 465 BC. During the game we get to know the reasons why the Assassins decided to act in secret. Assassin's Creed Odyssey: Legacy of the First Blade is primarily a series of new tasks waiting to be completed. The add-on also allows you to visit previously unavailable locations. 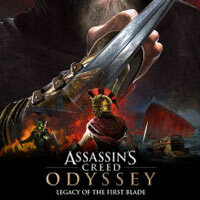 Legacy of the First Blade does not change the audiovisual layer of Assassin's Creed Odyssey. Since this is a non-self-sustaining extension, it requires a basic version of this production to operate.